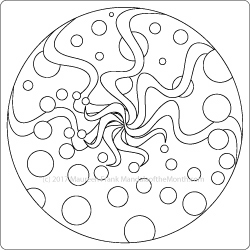 This month’s mandala encourages us to remember who we really are, what makes us tick, what inspires us. Even focusing just 5 minutes a day re-membering with our true selves, moves us light years ahead. It helps clear the muck of indecision and stuck-ness. Too often we lose ourselves in our day-to-day lives, forgetting our dreams, or worse, making everything else in our lives more important that our dreams. It may even be the case where we have forgotten how to dream or have lost hope of ever achieving them. That’s okay. Just being aware of that fact, helps us know exactly where we are and therefore exactly what we need to do next. When we experience doubt or fear of any kind, stop…breathe into it and release it. Connect with our true essence, our heart’s desire. For starters it may be a small spark or ember within our heart center. That’s okay, all we need is a spark to build the fire. Focus on that one spark and follow its lead. Again, even 5 minutes a day doing something towards fulfilling our dreams moves mountains. Ponder this while coloring this month’s mandala.